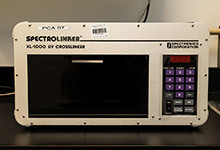 Description: The Spectrolinker XL-1000 UV crosslinker was made for applications including eliminating PCR contamination, cross-linking DNA and RNA, nicking ethidium-bromide stained DNA, gene mapping, Rec A mutation screening and testing, UV sterilization, UV-induced polymerization, and UV intensity monitoring. It comes with a smart microprocessor controller and true UV monitoring circuitry which allow for results to be released faster and error free. The UV-monitoring assures set dosage is delivered protecting important test results from washout damage. The system increases the visibility of samples on autoradiograms, which can help provide better analysis.